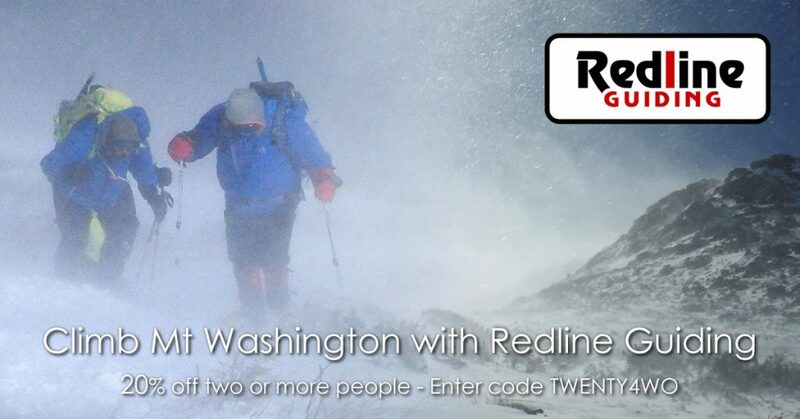 Take 20% off a Mountaineering on Mt Washington or other guided full day adventure and/or educational course for two or more people. This special, limited-time offer is exclusive of rental gear, food and water, premium and private options, and gratuities, and cannot be combined with other offers. It may, however, be used for two consecutive days of activities! Sign up for our two day program and get Winter and Mountaineering Skills training the day before your climb (strongly recommend), get completely dialed-in for the next day’s summit attempt, and save big time on all of it! Just select the two day mountaineering option on our booking form and choose two consecutive dates. Easy-peasy. To activate this offer simply add the coupon code TWENTY4TWO in the appropriate place on our booking form. This coupon code is valid until Jan. 15th, 2017 so book by that date to take advantage of this generous promotion. THIS OFFER EXTENDED UNTIL 2-15-2017.